Update: David has served his 30 days and is walking free! Update: David has said that he’s doing okay with reading material in jail, and he’s asked that anyone else who was considering sending books his way donate to Dineh relocation resisters on Black Mesa in Arizona instead. See the link on the right to learn more or donate. Thanks! David is spending this holiday season behind bars for his action to cut off the stream of money that banks invest in mining companies. enabling them to create the huge, capital-intensive surface mines that destroy the mountains of Appalachia. Because he refused to pay restitution, David is having to serve 31 days in Bridgeport Correctional Center. 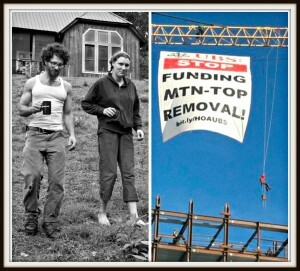 Over a year ago, David was part of an affinity group that hung a banner from a crane telling the nearby UBS headquarters to “stop funding mountaintop removal” as part of the Hands off Appalachia Campaign. This disposition comes after David has been summoned to court in Stamford 11 times to be jerked around by the Connecticut Judicial S ystem. We all know what a good “comrade” David is, and now it’s our turn to support him while he’s in Jail from Hanukkah through late January. David during his time in jail, we’ll need funding for his legal support, phone calls, and travel costs. Can you donate to David’s legal fund during this holiday season? http://bit.ly/donateHOA. If you want to do something for David directly, you can send him books to read! Just make sure they’re sent straight from Amazon or a similar book distributor and are new and paperback. You can also find more information about how to support David at http://www.prisonprofiler.com/content/Bridgeport-Correctional-Center-Connecticut or contact the RAMPS campaign via our facebook page. Thanks, everyone!